Towser was a new setter last year, and here we were with his second. His first was no. 4346 Nonconformist with its theme of detective fiction authors and the Baker Street IRREGULARS across the middle. This week, twelve thematic clues with just wordplay clues, and an unknown number of other entries with a thematic omission before entry. 2ac Rum affair, with time for right rum (6) was the first clue and TAFFIA my first entry, and I didn’t need Mrs B to help with the anagram of AFFAIT. (I could hear Shirley chortling at being able to put Towser on her list of setter lushes so early!) 6ac passed me by, as did 12, although it seemed that the number in brackets didn’t agree with the entry length. A quick scan of the other clues showed that about half disagreed, so Towser was being generous in giving us a helping hand with answer lengths. I persevered with the acrosses. Among them, ANDROIDS, ROSINATE and CORTISONE all disagreed with their entry length, as did the anagram of ROMAN [TAR]PEIAN at 45. They were all one letter to long for their entry length, so it seemed that a single letter needed to be omitted. 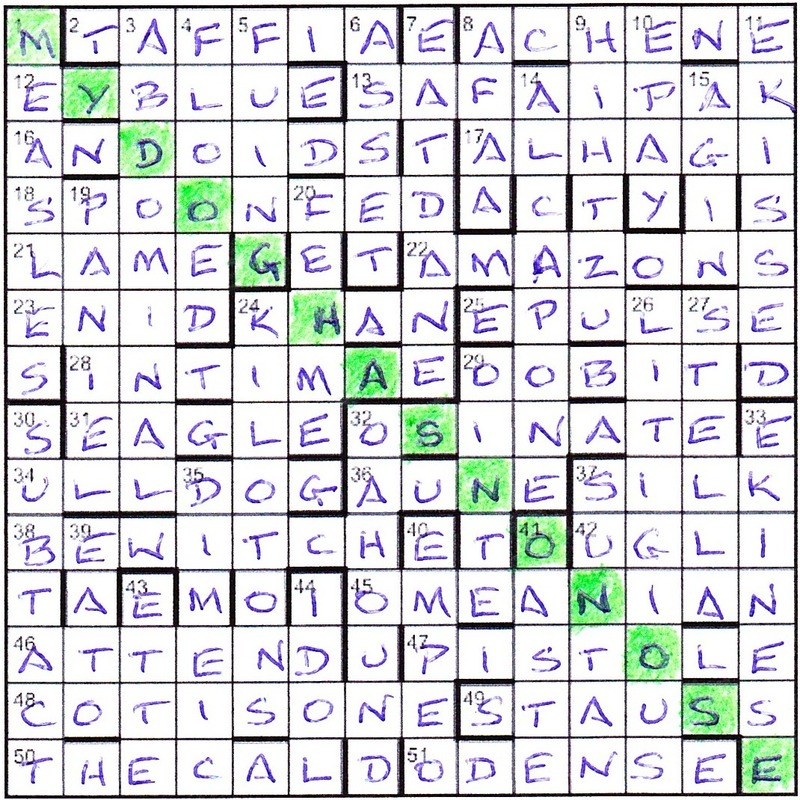 Unfortunately, they all contained I, N, O and R.
Still, I solved about 15 clues on my pass through the acrosses, but since it was a relatively large 14×14 grid, they looked rather sparse. I started on the downs and wish I’d done so sooner: 3, 4, 6, 8, 10 and 11 were slotted in smoothly. 6dn Item of property placed beneath bishop (6) was A•S•• and BASSET without its B indicated that the theme could be headless hounds. Meanwhile, FLOORED, AFAR, REPAY and REKISSED revealed that the letter R was probably the one which needed to be dropped, but the thematicness of that single letter escaped me. A short while later, and 33dn Keeps in drunk earl (8) confirmed the dog theme, with [P]EKINESE going in the grid. 45 minutes into the solve and I had the two strands of the puzzle identified. Another hour saw the grid complete, including the nice thematic clues at 14 County Down (9, two words) for KERRY BLUE and 43dn Towser, in this instance (6) for SETTER. For the second time in as many months, OOBIT was the answer “in earlier editions”. A check on the leading NW—SE diagonal revealed the start of the old joke MY DOG HAS NO NOSE*, hence the first letter being dropped from the twelve dogs in the grid. But why the R. I needed to consult Chambers to see that the letter R is “(sometimes called the ‘dog letter’, from the trilling of the tip of the tongue in its pronunciation in rhotic accents)”. Thanks to Towser for an entertaining puzzle and especially for providing a couple of seconds of humour on an otherwise cold and windy winter afternoon. This entry was posted on 5 February 2016 at 4:00 pm	and is filed under Solving Blogs. You can follow any responses to this entry through the RSS 2.0 feed. You can leave a response, or trackback from your own site. Thanks for the update, Roger. I’ll mention it in next week’s blog.